Need a Kiln? Rent one of ours! and we will fire it for you! You get table space and the use of all tools. or just have a warm place to work! Email to sign up now! 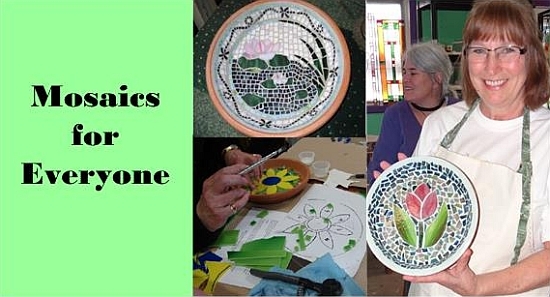 We've had such a great response to our Mosaic Design Class we need to schedule it again! If you are interested in participating, sign up now. 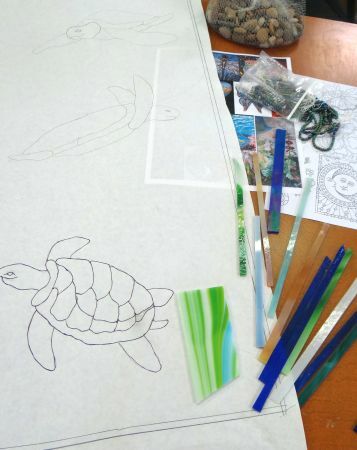 We'll help you design your own mosaic by putting together various templates or based on your own drawing, show you ways to lay out your tiles to give your piece more movement, choosing your board or project base, adhesives, using found items and more. 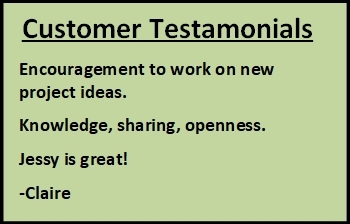 Continue working on your project during any open workshop or on your own at home. $30 includes class and materials charge. 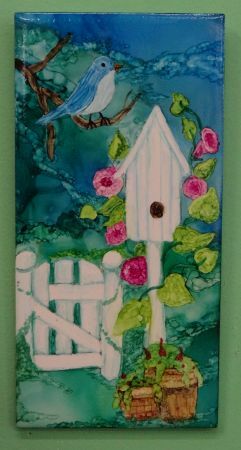 Practice your alcohol ink techniques with this birdhouse nestled in a lovely garden. Use a masking liquid to block off your focal points. 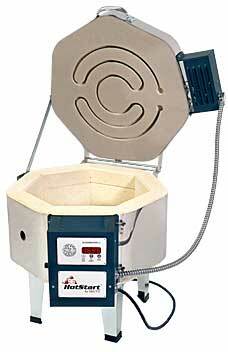 Are you afraid to leave the safe realm of "AUTO" on your HOT START and journey into the world of kiln programming? We can make it easier for you. In this YouTube video, we'll take a look at customizing your "AUTO MODE" with "EDIT MODE FEATURES" and flip into "PRO MODE" so you can start running your own programs. Learn one of the fastest growing mediums in glass! In this two week class you'll complete a 4" tile and a small fused & slumped plate. Covers firing programs, prepping kiln shelves and ware and much more! Email to sign up for future classes. 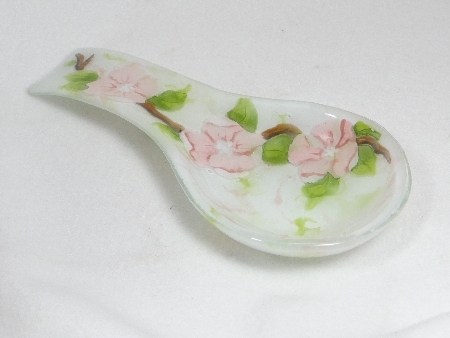 This 10" x 6" spoon rest is not only beautiful but a handy accessory for any kitchen. Learn how to make dazzling crackle technique backgrounds to accentuate your fused glass pieces. 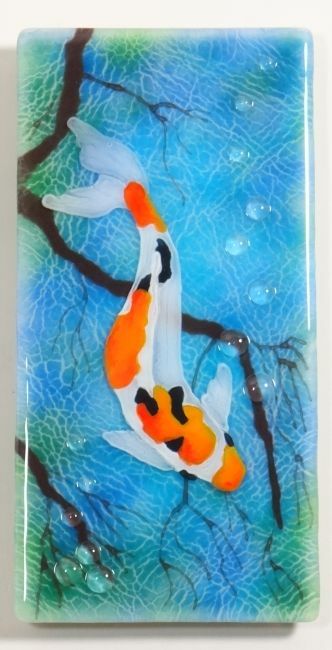 This class will incorporate a crackle technique background and painting with glass enamels on both surfaces of the top layer. Glass, fiber paper, powders, paint, glass nuggets and two firings are included with this 2 class project. You will be required to wear an N95 respirator. They are available for sale if you do not already own one. 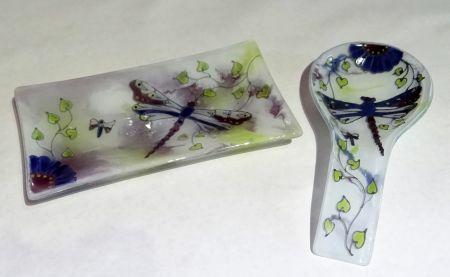 Make a beautiful spoon rest or small platter adorned with this stylish dragonfly. We�ll cover using the black outliner over your pattern and fill with shades of purple, orchid and greens. Learn how to use a watercolor background to complement your focal point. 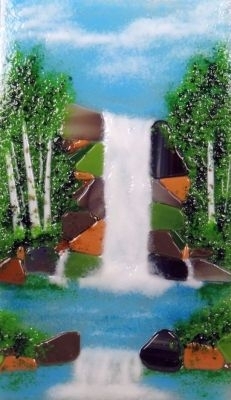 All paints, glass and two firings are included in this easy fun class. 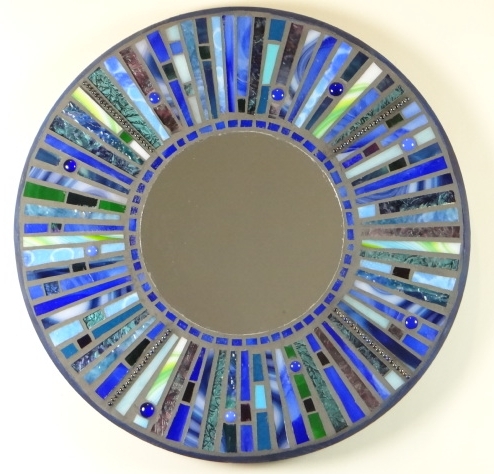 Learn how to mosaic just about anything in this fun and functional Mosaic Mirror class. We will cover adhesives, grouts, colorants and sealers in the process of making this beautiful 14" mirror. The first class is laying out the glass tiles. If you don't finish in class you may take home for homework. In the second class you will pick your grout color and apply the grout. The class fee covers the 14" round base, mirror, adhesive, grout, colorant and sealant. You cover your glass choices. 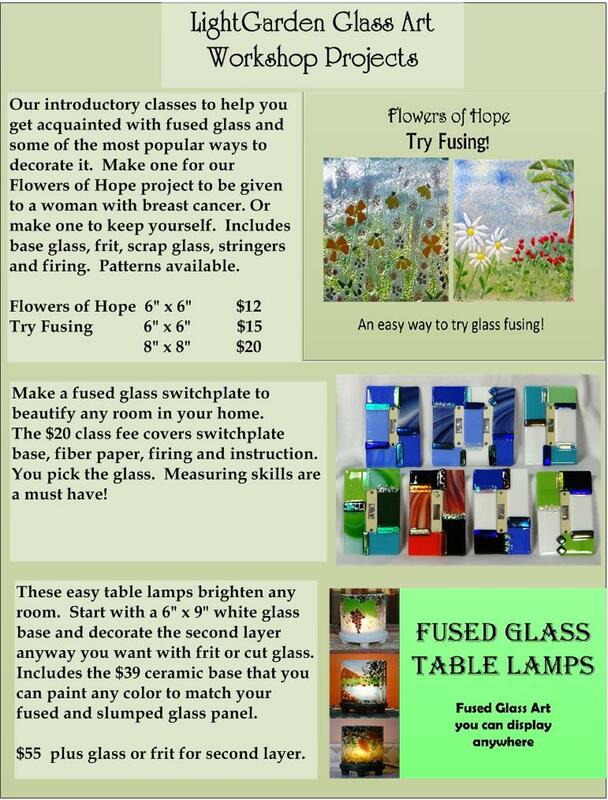 Email to sign up for future classes! 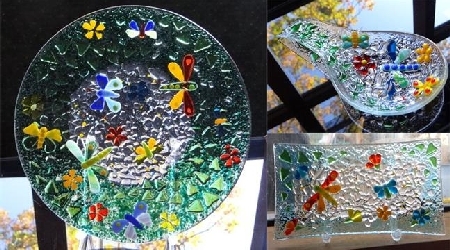 Here's a great little project for learning to paint with glass enamels. Makes a great gift. All materials and firing included. scrap glass. Includes clear base glass. once you know all the tricks! Cast with frit, these elegant accents will add a touch of beauty to any room. Great new "functional" art project for shows too! 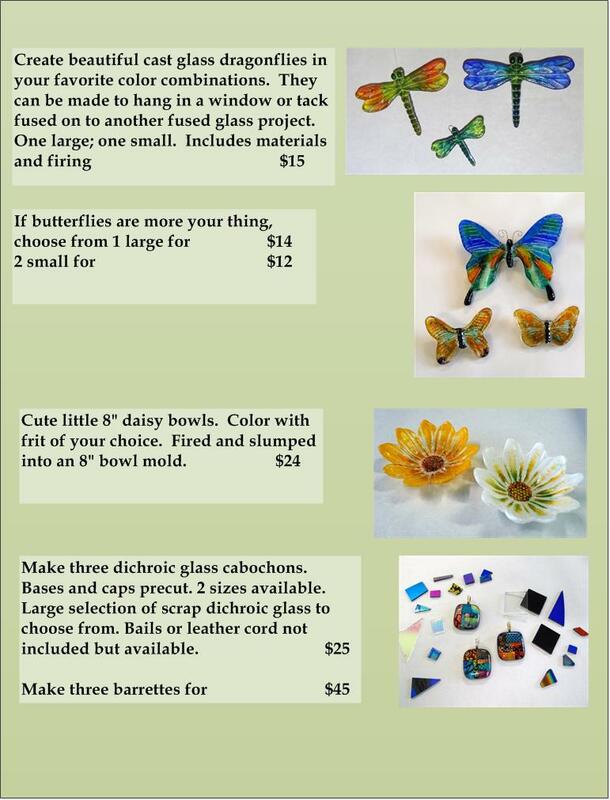 The $45 class fee includes the casting form that you keep, hardware, all materials, glass frit and instructions. 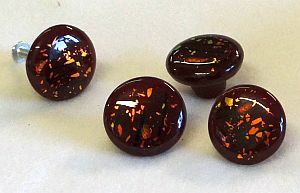 (Samples are shown with dichroic. Please sign up early enough to get the forms ordered. If we do not have at least 3 signed up we will cancel the class. Make a fun project for your spring garden! 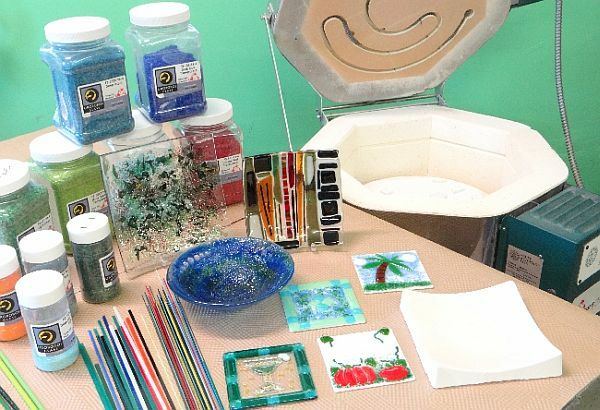 Learn speedy ways to make lots of tiles from your scrap glass, several techniques for applying mosaics to different surfaces and complete a 10" bird bath/feeder. Once you finish this class you'll know how to mosaic almost anything. Several patterns to choose from. The class fee includes all materials and tools. All you buy is the glass. We'll explore different techniques through 3 small panels, focusing on clouds, trees, water and layering backgrounds. We'll also address combining colors and picture composition. Snowflakes, penguins, reindeer, angels and more. Put them together and we'll fire them for you. 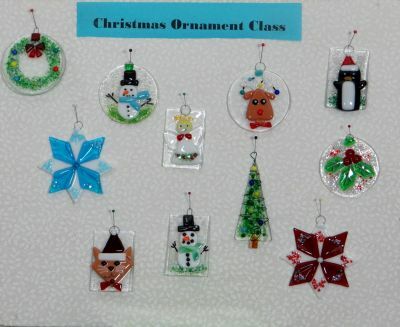 Get in the holiday spirit with this fun project class! Make three ornaments for $30. Many pieces pre-cut. You may add additional ornaments for $5. Email to sign up for future class. deposits for classes are not returnable or transferable unless we can fill your spot.